The Pike Place Fish Market, founded in 1930, is an open air fish market located in Seattle, Washington's Pike Place Market, at the corner of Pike Street and Pike Place. It is known for their tradition of fishmongers throwing fish that customers have purchased, before they are wrapped. After nearing bankruptcy in 1986, the fish market owner and employees decided to become "world famous", changing their way of doing business by introducing their flying fish, games, and customer performances. Four years later, they were featured repeatedly in the national media and television shows. The store is now a popular tourist destination in Seattle, attracting up to 10,000 daily visitors, and is often billed as world-famous. The Pike Place Fish Market was purchased in 1965 by John Yokoyama, a former employee of the fish market, who bought the store to make enough money on an owner's salary to afford the car payments on his new Buick Riviera. Initially, Pike Place Fish Market was unknown outside of the Seattle area, but Yokoyama and his staff decided to change that in a meeting with a business coach in 1986. Prior to the meeting, the Pike Place Fish Market was near to bankruptcy, and the consultant, Jim Bergquist, was helping them to conceive of ways to save the business. A fish market employee at the meeting suggested that they not only save the business, but make it "world famous", with the ideas for the business' flying and thrown fish, games with customers, and staff attitudes of always enjoying their work, so that customers would as well. In an interview, Yokoyama stated, "We took a stand that we were going to become world famous. We just said it and it became so." Four years later, in 1990, Ted Turner's Goodwill Games were held in Seattle. News crews at the Pike Place Market discovered the fish market and its performances with customers, and they filmed them. Soon afterwards, the fish market appeared on Good Morning America, leading to the business and its employees being filmed by various film crews, and being featured in numerous magazines. Now, during the summer tourist season, the fishmongers will perform now in front of as many as 10,000 visitors daily. The success of the business has been cited to its human resources and employee attitudes. The employees of the fish market will often speak to businesses, civic groups, and schools on ways to be successful, and has led to their being featured in motivational books. A popular feature at the Pike Place Fish Market is the monkfish, which sometimes, thanks to a hidden line, is made to "snap" at customers. In 1991, CNN named the Pike Place Fish Market as one of the three most fun places to work in America. In 2018 the market was bought by former employees. The Pike Place Fish Market is best known for their habit of hurling customers' orders across the shopping area. A typical routine will involve a customer ordering a fish, with their fishmongers in orange rubber overalls and boots calling out the order, which is loudly shouted back by all the other staff, at which point the original fishmonger will throw the customer's fish behind the counter for wrapping. Initially, the shouted repeating of the ordered fish began as a prank on one employee, but was enjoyed by customers, so it became a tradition. While working, the staff continually yell to each other and chant in unison while they throw ordered fish. At times, the fish market staff will throw a foam fish into the crowd to scare bystanders, or select a customer from the crowds to participate in the fish toss. Above the areas in which they throw fish, the market hangs a sign that reads, "Caution: Low Flying Fish". In 1998, the Pike Place Fish Market was the subject of a documentary film and accompanying book, FISH! Philosophy. The Pike Place Fish Market has also been the setting for several best-selling corporate training videos, the aforementioned FISH!, and also FISH!Sticks, which have been used by firms such as Enterprise Rent-A-Car, Sprint Nextel, Southwest Airlines, Sainsbury's, Saturn, and Scottish and Southern Energy, for employee training. The Pike Place Fish Market has been featured in a variety of television shows and commercials. These include a Spike Lee Levis jeans commercial; MTV's The Real World; NBC's Frasier, and ABC's Good Morning America. In films, they have appeared in Free Willy. Reference to the Pike Place Fish Market is also made by American hip hop duo Macklemore & Ryan Lewis in their 2015 single "Downtown" featuring Eric Nally, Melle Mel, Kool Moe Dee and Grandmaster Caz. ^ a b c d e f g "Caution: flying fish ahead: the 2006 general session promises insights, smiles and scales". Parks & Recreation. National Recreation and Park Association. 2006-09-01. Retrieved 2007-05-27. ^ "Delicious ways to explore Seattle's foodie paradise". The San Diego Union-Tribune. October 17, 2010. ^ "Our Humble Beginnings". Pike Place Fish Market. Archived from the original on January 23, 2008. Retrieved 2007-05-27. ^ a b c "HR philosophy goes fishing for positive work attitudes". Seattle Times. 2008. Archived from the original on July 8, 2011. Retrieved 2007-05-27. ^ a b c d Bauman, Margaret (2006-11-26). "Good times means good business at Pike Place". Alaska Journal of Commerce. Archived from the original on January 8, 2009. Retrieved 2007-05-27. ^ "'It's surreal': Seattle's Pike Place Fish Market sold to fish-throwing employees". The Seattle Times. 2018-07-20. Retrieved 2018-07-21. ^ a b c Lelyveld, Nita (2000-08-04). "Pike Place fishmongers showing up as examples of fun at work". Philadelphia Inquirer. Retrieved 2007-05-27. ^ Pfeiffer, Cristina (2006-03-22). "Seattle highlights". The Age. Melbourne. Retrieved 2007-05-27. ^ "Fishy tale could cause indigestion". Europe Intelligence Wire. Financial Times Ltd. 2005-11-08. Retrieved 2007-05-27. ^ Landro, Laura (2006-08-19). "How I Got Hooked on Seattle". Wall Street Journal. Retrieved 2007-05-27. When Fish Fly: Lessons for Creating a Vital and Energized Workplace — From the Word Famous Pike Place Fish Market, Yokoyama, John and Joseph Michelli. New York: Hyperion, 2004. 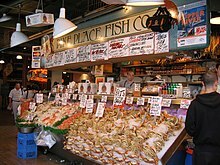 Wikimedia Commons has media related to Pike Place Fish Market.